Microsoft internet explorer has been under threat; Microsoft has asked all its windows based users to install free security software to protect their computers from a newly found bug in the Internet Explorer. 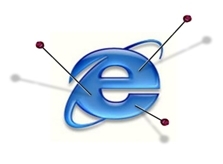 According to sources and researchers say that it may allow hackers to take control of the infected computer, about millions of people around the world uses internet explorer for their day to day browsing , the affected versions of internet explorer includes 7,8,9 while IE 10 is not affected . When a user visit infected websites the malicious code is downloaded to their PCs, Microsoft said to all its users to install security software which gives them some time to fix this bug. The free security tool, which is known as the Enhanced Mitigation Experience Toolkit, or EMET, is available on Microsoft’s website. Dave Marcus, director of advanced research and threat intelligence with Intel’s McAfee security division, said it might be a daunting task for home users to locate, download and install the EMET tool.